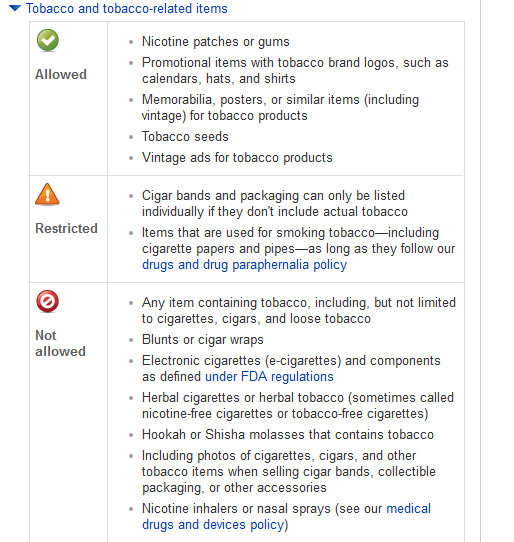 Why eBay is allowing E-Cigarette and Tobacco Products to be Sold, Regardless of their TOS¹. This is an easy one, it attracts young users. Young new users that predominantly purchase via the iPhone or Android App. 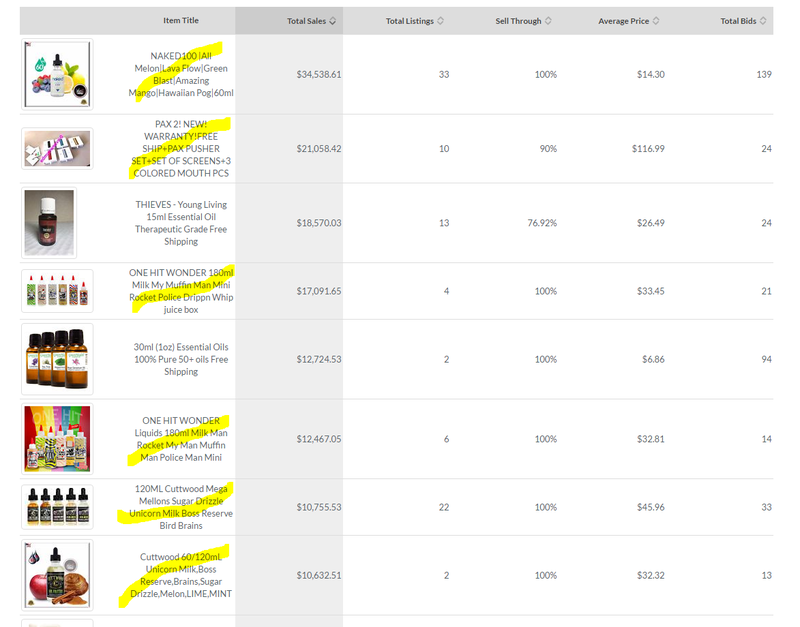 Also, the money, some of these products have the highest daily velocity and revenue on the entire site. Selling 80 items per day on eBay is ALOT. All of this is pretty easy to track with Terapeak and the ebay website. There are 2 primary types products for Vaping or E-Cigarette Consumption, the liquid or “juice” and equipment. Juice is what is consumed in the vaping process, you pour the liquid into a container, the container has a heating element that vaporizes the juice, inhale. Most juice contains nicotine, whether derived from a plant or made synthetically. The “nicotine level” is a common variation in Ebay listings and is usually titled “level” or something similar. You’ll know it when you see it. Variation options include “Three, 3, 12mg, 6 orange,” etc. Juices also come in a myriad of flavors such as strawberry fruitcake. There are too many to list. 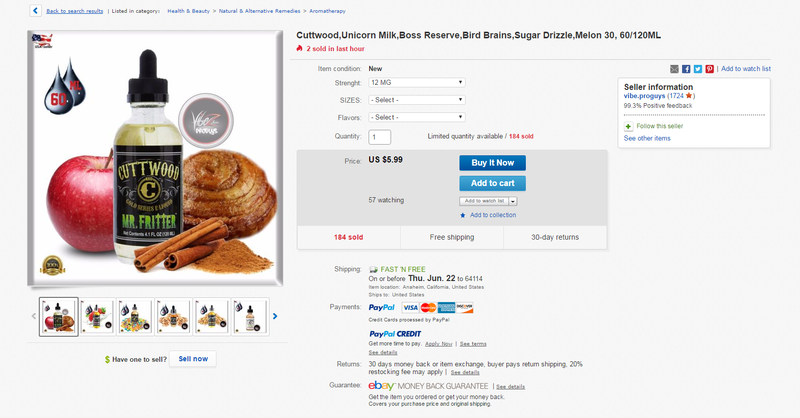 Regardless of nicotine levels, all of these items are consider for nicotine use according to the definition from the FDA (the standard eBay claims to use for prohibited items)².
E-liquids or Juice is usually hidden in the Aromatherapy Category. As you can see from a recent terapeak screenshot³, a significant amount of the biggest sellers in this category are E-Liquids intended for vaping and have nicotine in them. Its my opinion that ebay is complacent in these sales. They are well aware of the violations, some of these sellers have been on for a significant amount of time. Some of these sellers are doing 200k per month in sales. That is on the RADAR. That is considered a big seller, certainly a top 5% seller. Keep in mind the FDA now requires Age Verification for online sales of Tobacco products, including all e-cig devices and juices. eBay and the sellers do not have this capability built in, thus presenting a giant liability to both in the form of fines and prosecutions. In the time it took to write this peace and do the research, a few eBayers could have easily found the top 95% of vape sellers on their platform and closed the listings using their own tools. Ebay claims they are following up on items that are reported for violation. Clicking on those links do not seem to have an effect, even over long time frames. Then, why PayPal is in on the game too and why it’s an even bigger issue when it comes to discrimination against certain parties.